I made a ruckus last year in "World Class Marketing" for Guniness Cycling Convoy Record regarding the 'iceberg' that the Cycle Fest 2013 event would hit. It was such a massive failure that the state controlled news tabloid termed it World record-setting event flops from the get-go on March 6th this year. Look at the above screenshot from the 1.5mins video. Truly pathetic turnout. When the company hires a bunch of Yesmen or Yeswomen, it get what it deserves - nobody dare to voice out dangers. Just follow instructions blindly. Shut up & do your work quietly. Throw in extra overtime work if necessary, sacrifice family time, sacrifice friends/social time. End up all aboard the ship perish. Superiors at work find it hard to manage me cause i question things that i sense is dangerous.. It is hard to shut me up cause i will blog here on warnings about the dangers.on issues that catch my attention. Many bosses & managers in Sillypore find 'warning indicators' workers hard to manage. I suppose they like flying a plane with no warning indicators. Remember what the head of the union (govt minister) said about Cheaper, Faster, Better. Is cheaper to build a plane with no warning indicators installed. Is better to build a plane with no warning indicators installed. 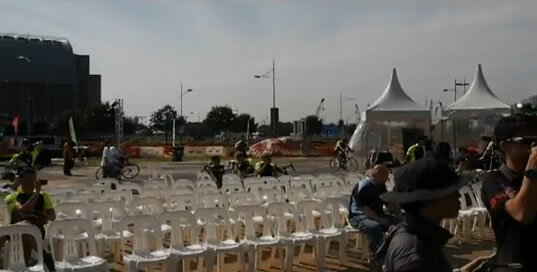 1.5mins video of Cycle Fest become Cycle Fail. I began sounding alarm when reports of Sinkie Workers bochup. Later when Yahoo published Sinkies Unhappiest in World that it reaches the sleeping masses.